This Gaiwan was produced in Jingdezhen, the pattern of flowers and the decoration of gold rim give it a sense of retro and modern. Enamel paint, a decorative method introduced to China from abroad, and was transplanted to a painting technique appling to porcelain. It is unique because it mixes rich colors which make the porcelain very beautiful. This Gaiwan is decorated with enamel painted flowers, which means prosperity. 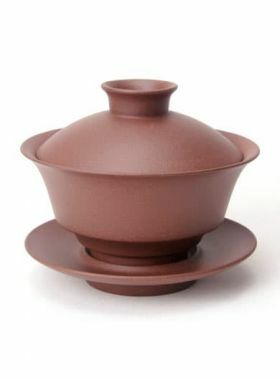 The entire glaze color is even, and the three-dimensional patterns can be felt by touching the surface of the Gaiwan by hand. The inside of the Giwan is white, making it easy to observe the color of the tea liquid. Its cup edge is also set with gold rims, which contrasts sharply with the colorful patterns on its surface, making an overall modern aesthetic based on the retro style. 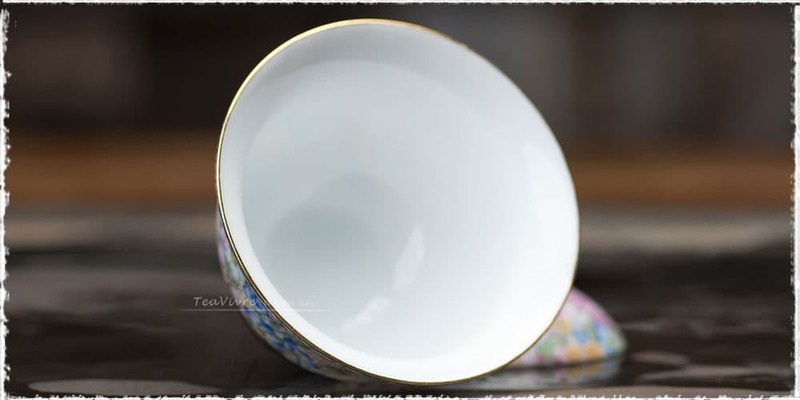 In addition, this bowl also has a tray; it can not only be shared with friends, but also can be used for solo sessions, like the Gaiwan Cha, scratch the tea leaves with the lid, and the tea will scatter and burst with aroma. What s wonderful enjoyment. 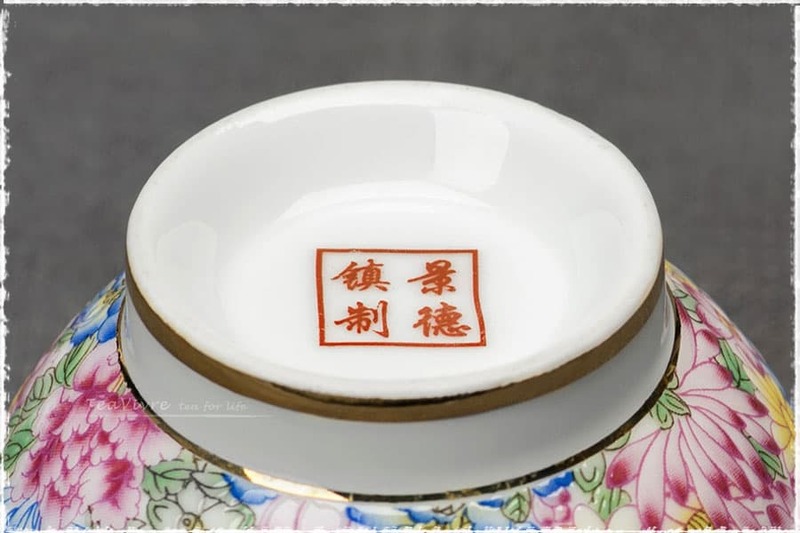 The characters on the bottom of the Gaiwan is: Made in Jingdezhen. The cup is delicate with smooth inner wall and golden rim. Jingdezhen is a famous porcelain capital, which has a long history of making porcelain since Chinese Han Dynasty. 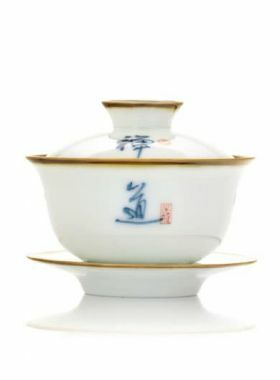 And since the Yuan Dynasty, it began to produce imperial porcelain for royal court. Jingdezhen’s porcelains have beautiful shape, wide variety, abundant decoration and unique style, and are famous for its characteristic of “white as jade, bright as a mirror, thin as a piece of paper, sounds like a chime”. 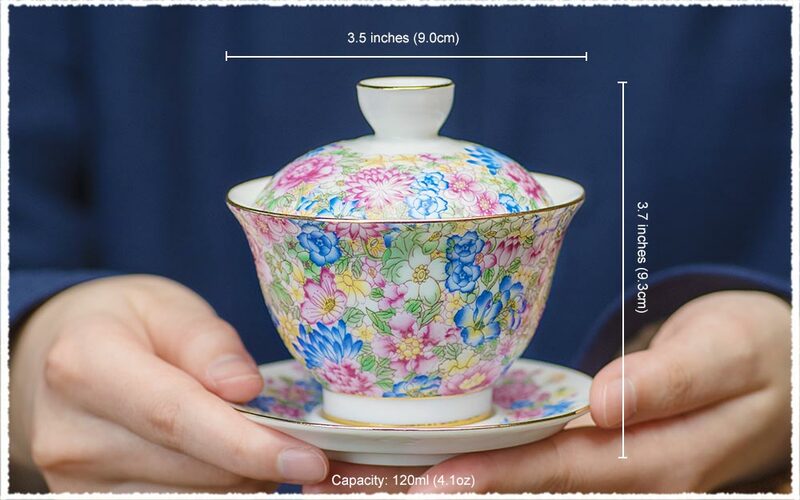 Jingdezhen’s blue and white porcelain, rice-pattern decorated porcelain, famille rose porcelain and color glazed porcelain are collectively known as the four traditional porcelain of Jingdezhen.